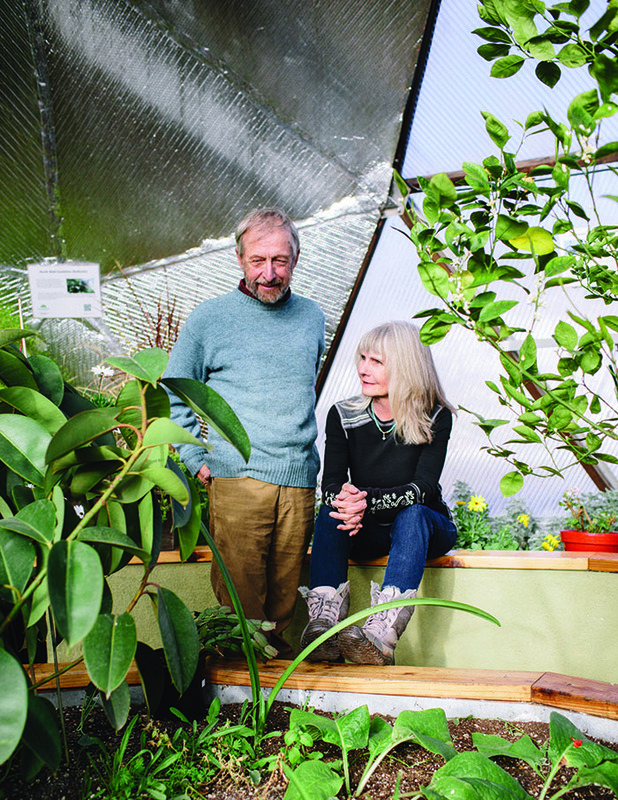 Photo by Rick Scibelli, Jr.
Long before much of anybody thought of having their own personal greenhouse, there was John Denver, iconic voice of the Rockies, and his biodome near Aspen. It was the mid-80s and working there was this former dentist, a Scottish guy named Udgar, who before first laying eyes on this biodome had figured out how to successfully farm a remote far-northern peninsula in his home country. “That was Aspen village in the Roaring Fork Valley. Probably in ’85,” Puja Dhyan Parsons said. Puja and Udgar met around this same time. They married about 10 years later. “No, that was 1989 when I built that first dome,” Udgar said. At first, Udgar and Puja built about 20 a year. Then, around 1995, they moved Growing Spaces from Aspen to Pagosa Springs. “Then everything suddenly took off,” Udgar said. “But what really kicked us off was Y2K. People are suddenly thinking, ‘What if the supermarket shelves are empty and there is no electricity?’” That year, 1999, they jumped from constructing 20 domes a year to 75. Today, the electricity-free, solar, hogan-shaped domes come in six different sizes ranging from 15 feet in diameter to 42 feet. How many domes do are you building a year now? Udgar: The average is about 125 a year. But it has been a gradual progression. We have just grown steadily and now we have a year around staff of about 14 people. In the busy season, it goes up to 25. Udgar: I wanted to learn more things in my life than just how to fill teeth. And somebody offered me a piece of land on the remote peninsula in the north of Scotland and I just felt to say yes. As a result of being so remote and isolated, I had to learn to do everything myself. Gardening. Fixing tractors. Building houses. Silage. Hay. So being a dentist just kind of faded away? Udgar: I always enjoyed it, but yes. The clincher was when I came to America, because my English dental license didn’t work. I applied twice to sit before the state board and national board and each time I missed the deadline. So I started thinking, well, there must be some reason I missed the deadline. So I took that as a sign that dentistry was not in my future. Puja, you said that everybody deserves good food. I get the feeling that this is more than just selling domes for you? Puja: It is about health. When I was a teenager, I had to be moving. Today, they might call it ADD or ADHD. But back then we didn’t know about hypoglycemia. We didn’t know that sugar was a bad thing. My mom was feeding us Kool-Aid. Udgar: She drank the Kool-Aid. Puja: It wasn’t until I became a vegetarian and had a more stable diet that my psyche stabilized. I had no idea that nutrition was the foundation of health on all levels. For Udgar, growing up during World War II on rations for the first seven years of his life, the garden was not only survival, but it taught him the joy of fresh food. We just got a letter from a woman who is healing her multiple sclerosis from one of our domes. It is the kind of letter we love to receive. Udgar: To eat fresh organic food is a powerful medicine. So if I put one of your 15’ domes (the smallest available) in my backyard, how much food can I expect to harvest? Udgar: Essentially, you can grow 2 to 2.5 pounds per square every year. So for a 150-square-foot dome, that is 300 pounds of fresh vegetables every year. And that is a lot. Udgar: I figured out from my 22-foot dome that it is about 4 hours a week. You sow the seeds, tend to the soil, and then harvest. Otherwise, you just watch things grow. The plants will tell you what they need. How do I take a vacation if I have one of these? Do I have to get somebody to take care of the dome and the dog? Puja: The dog, yes. With the dome, the only thing you need is some sort of automatic watering system set on a timer. It is designed for our lifestyle. You look at these things and you think, ‘Wow, this is so cool.’ But as a non-gardener, it might require more than I am willing or capable of offering. Puja: It starts to be therapy more than work. It’s healing. Most of our customers have never gardened. It hooks you in. A shift of priorities happens. Ugdar: You can’t go a day with knowing how the brussels sprouts are doing. I think this may be true in southwest Colorado. But I think there are two worlds. My relatives in Dallas, all educated, spirited, and active people, I guarantee they have never given one thought to a personal greenhouse. It would be a foreign idea. So how do you crack that world? Ugdar: There are two worlds. But Yoga was regarded as something totally weird 20 or 30 years ago. Now, yoga studios are popping up everywhere. There is a shift happening. It used to be only Waldorf and Montessori schools buying the dome, but now a lot more public schools are installing them. It is getting out there in the community. Richard Miller (a consultant to Growing Spaces): By the way, we have put domes in Dallas. Can a family of four who lives in Montezuma County on around $50,000 a year afford one these? Puja: Yes. You can also make it more affordable by banding together with other people and making it a community garden. More often now people join together. And we have built several of those. Ugdar: Where are you going to get fresh food in the middle of the winter? The market. Thus, over the lifetime of a dome (approximately 20 years), the investment can pay for itself 3 or 4 times over. Ugdar: Keep growing. The systems of the dome keep it warm in the winter and cool in the summer. Water tanks stabilize the temperature. And will you help with that? Will you plant for me? I think there is a large swath of the population who wants to enjoy a greenhouse without the time needed to master it. Udgar: We will tell you what to do. We have people who will set it up for you and plant it for you. We will provide. Miller: We are only successful as you are. You are suggesting it can convert the non-gardener in to the gardener? Puja: Absolutely. It is so much fun. What will grow in the winter? Ugdar: Mainly leaves and roots—beets, turnips, radish, parsnips, lettuces—swiss chard, kale all the members of the cabbage family, broccoli. Peas grow well in the winter. And all the herbs. Parsley loves the winter in the dome. Can I grow a banana tree in here? Miller: Yes. You might have to augment with a little heat now and then, but yes.